Honor Show Chow Showlamb Creep Pellet DX feed is designed as a creep feed for show lambs through weaning. This feed is pelleted and medicated with Deccox to help prevent coccidiosis. Honor Show Chow Showlamb Creep Pellet DX feed is supported by Purina Mills Animal Nutrition. Get your best animals on Honor Show Chow Showlamb Creep Pellet DX feed today so they can reach their full potential. Fully fortified to meet the requirements of fast growing, heavily muscled lambs. Offer Honor® Show Chow® Showlamb Creep Pellet DX as in a creep feeder when lambs are 10 – 14 days of age. Feed at the rate of 0.5 lb per 30 lb body weight to provide 22.7 mg Decoquinate per 100 lb body weight daily. 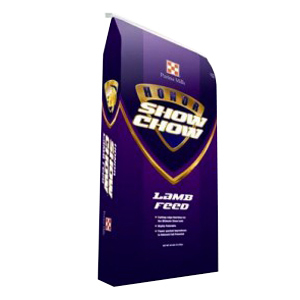 Honor® Show Chow® Showlamb Creep Pellet DX may be fed for a longer time period where a high protein ration is desired before transitioning to Honor® Show Chow® Showlamb Grower. Designed to be fed with roughage. Tips for starting young lambs on feed: Offer straight soybean meal in the creep feeder when lambs are 7 to 10 days of age. Offer Honor® Show Chow® Showlamb Creep Pellet DX Pellet 7 to 10 days after beginning soybean meal. Remove soybean meal 7 to 10 days after introduction of pellets. Reminder: Feed is perishable and should be stored in a clean, dry, well-ventilated area so it will remain fresh and palatable. DO NOT feed moldy or insect infested feed to animals as it may cause illness, abortion or death. Fresh, clean water should be available at all times.